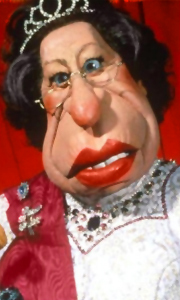 Own Spitting Image Series 1 to 7 DVD from Deff, DVD, Blu-Ray & 4K Video Specialists - Free UK Delivery..
Own Spitting Image Series 10 DVD from Deff, DVD, Blu-Ray & 4K Video Specialists - Free UK Delivery..
Own Spitting Image Series 11 DVD from Deff, DVD, Blu-Ray & 4K Video Specialists - Free UK Delivery..
Own Spitting Image Series 12 DVD from Deff, DVD, Blu-Ray & 4K Video Specialists - Free UK Delivery..
A milestone in television comedy, Spitting Image lifted satire to a new level for over a decade through the 1980s and '90s. No target was safe from the series’ gunsights: politicians of all persuasions, Thatcher, Nelson Mandela and even the Royal Family could find themselves up for a ribbing on any given programme. This complete eighth series showcases Prince Edward asserting his masculinity, Kinnock denouncing the opposition for having..
Own Spitting Image Series 9 DVD from Deff, DVD, Blu-Ray & 4K Video Specialists - Free UK Delivery..